The Secret Policeman’s Ball is the best named charity event. It’s been proven with science. However, not far below it on the ladder of well-named giving festivals is Awesome Games Done Quick. And, dammit, it’s more explanatory than most names so it gets bonus points for that. Last year’s AGDQ even raised $448,423.27 to be spent on cancer research. Take that, cancer. This year’s speedrun event should raise even more. This year the AGDQ will feature 150 hours of speedruns. You’ll see the best of the Speed Demos Archive team show off their skills by racing through games like Mario, Contra, and Half-Life. Like last year, the team are raising money to donate to the Prevent Cancer Foundation. As well as back to back live runs of loads of games, the team liven things up pretty regularly by performing challenges like playing fighting games blindfolded. This isn’t the event to watch if your gamer’s ego is easily bruised. These folk are ridiculously good players and, in minutes, will make mincemeat of games that you remember taking you hours in your childhood. 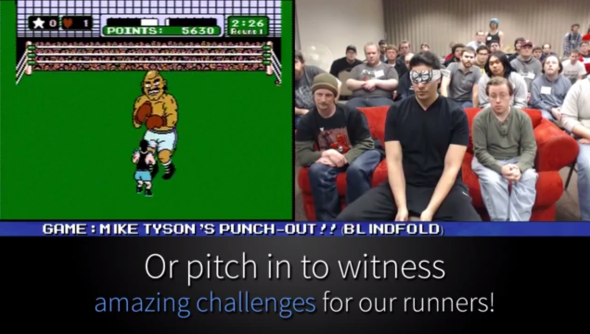 Awesome Games Done Quick 2014 will start off on the 5 January and run till the 11 January. You can read more about it over on their site.